A toy store like this would be loved anywhere. But you rarely see this kind of vision in places other than the great cities of the world. We are excited to be on the cover page of the Travel + Leisure September issue! Offering handcrafted toys inspired by children and nature. 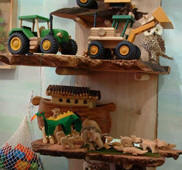 Shopping for Eco Friendly and Natural Wood Toys in New York City. Jan 20 2010 By Marcy We recently wrote about some wonderful places to Shop for Handmade Toys and Children’s Items in New York City. Playing Mantis toy stores sell simple, handmade toys that promote an interest in the global community. Walk into Nyack’s Playing Mantis toy store, and you get an immediate feeling of Zen. That’s not a feeling associated with big-box retailers, which are dominated by aisles of manufactured plastic playthings that honk, beep, flash, bang, clang and cry. Make no mistake: Playing Mantis has its fair share of cars, trucks, trains, dolls and games. But not a single toy there requires batteries or an electrical outlet – and all still manage to inspire lots of fun. “I call it an imagination-powered store,” says owner Imelda McCain.